Muscle-bound screen legend David Hasselhoff, hero of Baywatch and of course Meet The Hasselhoffs, has released his own iPhone app. Called Ask the Hoff it’s based on him. 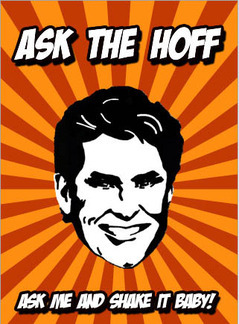 After the user asks a question and shakes the phone, an animated version of the Hoff replies with one of a number of pre-recorded responses, voiced by Hasselhoff himself. So yes it’s like a magic eight ball with Hasselhoff theme. The app is called Ask the Hoff and costs 59p. A UK company called Never Odd Or Even a bears the distinction of making it. David Hasselhoff trivia: apparently he is listed in the Guinness Book of World Records as “The Most Watched TV Star in the World”.